The NWS Storm Prediction Center's outlook for this afternoon and evening shows the better chance of very large hail and damaging winds. The hatching means that there is a chance of hail 2" in diameter. The significant threshold is 15% (yellow) with the higher risk in northern Kansas and southern Nebraska. 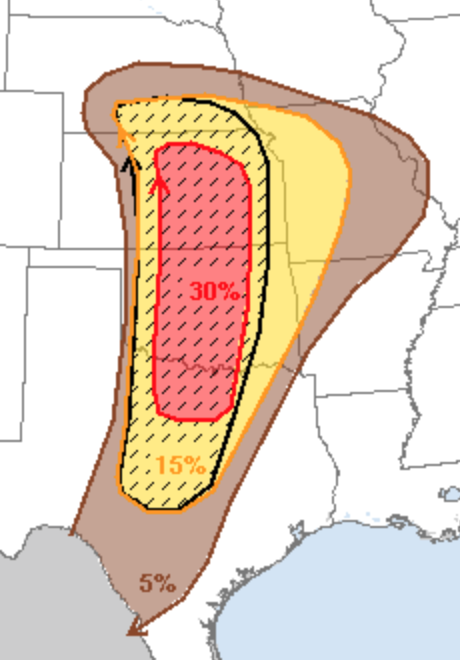 The SPC's tornado outlook is 5% (the significant threshold for tornadoes). I personally believe the greater chance of a tornado or two is in the southern part of the tornado outlook. So, please pay attention to the weather if thunderstorms approach. 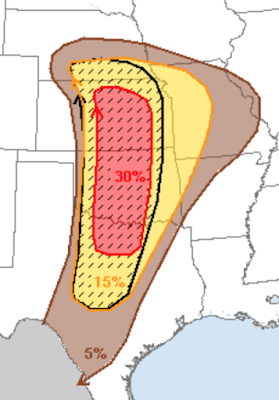 For Tuesday and Tuesday night, there is a good chance of a tornado outbreak along with hail and wind storms. 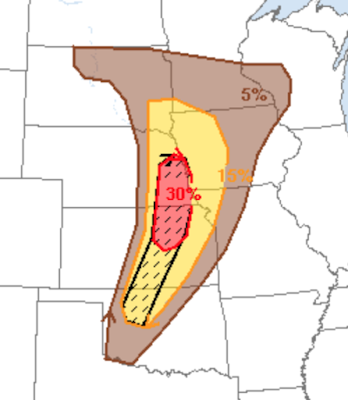 The hatched lines indicate areas where violent tornadoes may occur. It's a bit scary that we are forecasted for such a violent outbreak here on the 25th Anniversary..?